The City of Manistee and Manistee Area Public Schools entered into an Interlocal Services Agreement for the operation and maintenance of the new community swimming pool. Counsilman-Hunsaker and Integrated Architecture designed the natatorium with an eight lane 25-yard competition pool, which can also accommodate water polo. Pool gutters are constructed of concrete and tile in a deck level configuration for easy ingress/egress. The facility also includes a shallow warm water pool with a large entry stair and a depth range from 3 ft. to 6 ft. An ADA transfer system, a resistance/current device, and a hydrotherapy bench were also included. 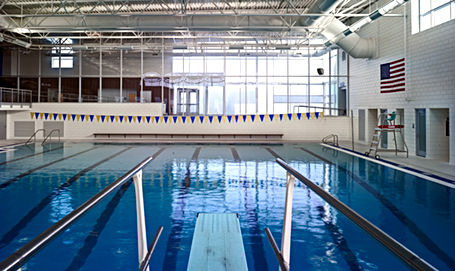 Moreover, the Paine Aquatic Center received Leadership in Energy and Environmental Design (LEED) certification by the U.S. Green Building Council.